The Anunnaki myth is ancient, dating some 6,000 years to Sumerian writings on clay tablets. But it persists thanks to contemporary authors like the late Zecharia Sitchen and Barbara Hand Clow. The modern stories appear linked to a time in the 1840s when astronomers John Adams and Urbain Le Vernier published papers theorizing that certain gravitational actions within the solar system pointed to the possible existence of an unknown planet. That Pluto and Triton, the planet-sized moon around Neptune, were discovered soon after this did not seem to satisfy the mystery planet buffs. Percival Lowell, the man best remembered for his declaration that he found canals on Mars, was first to produce the name "Planet X." Sitchen called it the Twelfth Planet in his book by that name. Sitchen not only supports the concept of a mystery planet that circles our sun every 3,600 years, he uses the Sumerian name Nibiru and claims it is inhabited by an advanced race of beings called the Anunnaki. 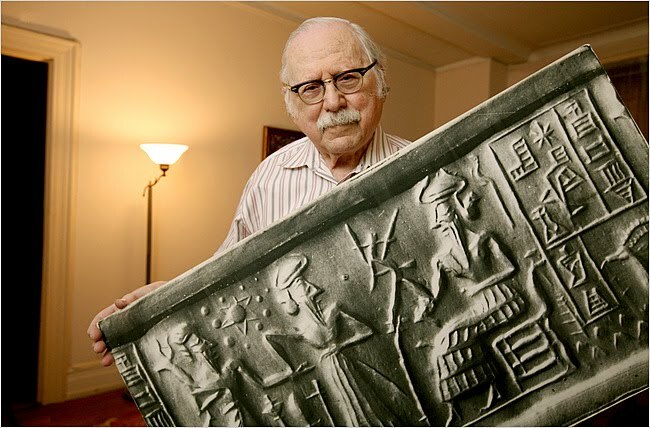 Sitchen drew stories from the Old Testament and ancient Sumerian writings about "giants" that came to earth to support his case. His story is that the Anunnaki came to earth to create and then enslave the human race because they wanted workers to mine gold. "I learned to read the cuneiform Sumerian texts and came upon their persistent and repeated statements that those beings, who the Sumerians called Anunnaki, came to earth from a planet called Nibiru," Sitchen said. "The planet was designated by the sign of the cross and Nibiru meant planet of crossing." He said he drew heavily from the Mesopotamian Epic of Creation, from which the first chapters of Genesis appear to have their origins. In this text, Sitchen said he found "all details about the Anunnaki, who they were and who their leaders were and how they traveled from their planet to earth." He said he believed they splashed down in the Persian Gulf on their first visit. In her book, The Pleiadian Agenda, Clow delivers what she calls messages received from various other alien races to the people of Earth. The book describes the Anunnaki as an alien race that has successfully controlled the consciousness of the human race and continues to do so. During a co-habitation that lasted for thousands of years, "the Anunnaki used earthlings for workers and sexual services while gradually altering their DNA," she wrote. Among the very ancient books can be found the Book of Enoch, from which is found the Genesis story of the pre-flood invasion by "the sons of heaven" who descended upon earth and begot children from the women. These children turned out to be "giants" that overpowered the people, consumed all of the food, and in the end "burned upon the humans." Interesting details in the Book of Enoch reveal that there were about 200 angels in that group, all of them led by an individual named Samyaza. The children, according to a Greek text, were known as the Naphelim. During the occupation, according to the text, angelic beings set about teaching humans sorcery, divination of roots, astrology, metallurgy, "the fabrication of mirrors and the workmanship of bracelets and ornaments, the use of paint, the beautifying of the eyebrows, the use of stones of every valuable and select kind, and all sorts of dyes, so that the world became altered." The ancient book, Epic of Gilgamesh, describes Gilgamesh as two-thirds god and one-third human, a super-human king who oppressed the people. It is interesting that a "sky-god" named Anu came to the people’s defense by creating a beast, Enkidu, that became a rival to Gilgamesh. Also, Gilgamesh built a great city named Uruk. The similarities between this and the ancient city of Ur, in Iraq, are unmistakable. It is tragic that U.S. and British forces bombed flat the ruins of Ur during the illegal invasion of Iraq. Thus the archaeological research that might have helped us understand the stories in these ancient books has been destroyed by foolish and greedy men seeking control of the Middle East for political and financial reasons. Valuable artifacts from archaeological work already accomplished at Ur were stolen or destroyed when the museum at Baghdad was sacked. We have touched on a few of the stories about an invading force of powerful beings that dropped down out the sky to earth many thousands of years ago, and changed life for the human race forever. That Gilgamesh is described as part-human and part-god, and that he was a "super-human" ruler over the others, suggests that this was a myth about the Adam Kodman of human origins. The story in the Book of Enoch, that the Naphelim taught humans how to work metals, make jewelry, do magical incantations and divine for things in the ground suggests that once the DNA was implanted, the humans had to be taught to go beyond the basics of animal survival and develop their brains for more complex tasks. Thus it was that Gilgamesh could build a city and rule over the other humans that followed him. That the myth includes a promised return of the aliens every 3,600 years suggests that either the Anunnaki made return visits to Earth, or that there was a promise of a return at some distant point in the future. Here we have the myth of the promised return of the god figure that has been handed down in religious stories ever since. Sitchen noted in his writings at Mesopotamian art includes a cylinder seal, found at Nippur, depicting plowmen in a field, looking up into the sky with awe at something shaped like a cross. He suggests that the cross is symbolic for the twelfth planet.